Antiquity is busy today, as Rome II’s patch 16 pops into existence with performance improvements, tweaks to battles and campaigns, and balancing changes. A little more glamorous are the two bits of DLC which also launched today, and one of them’s free. You’ll need to shell out £5.99/$7.99 for the Black Sea colonies pack, which comes with three new factions along with new cultural traits, faction traits and units. And if you’d rather keep your cash safe, you can still get Rome II’s 12th piece of free DLC, the faction of Massilia. The Black Sea factions are Greeks-turned-Celts, settlers from Greek city states that settled far afield and mingled with the locals. The three factions are Cimmeria (not to be confused with Conan’s people), Pergamon and Colchis. Each faction gets two cultural bonuses, improving research and cultural conversion, while they get their own unique faction traits, too. Massilia is another hybrid faction, with Greek settlers and Gallic tribes. Take a look at the next page for the full patch notes. Fixed a rare projectile crash in battles. Adjustment to Campaign AI to force factions that have just become known / discovered to take on the current attitude towards the player, rather than be neutral. Fixed bug with Celtic Linothorax armour on units in battle. Fixed misaligned settlement walls in Tigranocerta city battle map. Stopped infantry user triggering “riders into wedge” voiceover during battles. Armies moving from a settlement will no longer trigger “move completed” dialogue lines before their move has begun. Armenia can no longer use large onagers when defending in a custom siege battles. Fixes for seasonal effects and adjustments to income types and amounts from buildings in the campaign so subsistence is more favoured. Diplomatic scores have been lowered in general, and It is now harder to make client states. Factions are now listed in 2 columns in the Custom Battle and Multiplayer *Lobbies, to prevent the faction list going off the bottom of the screen. Fixed a Roman minor port coastal battle map, where units could disembark on an out-crop of land at the edge of the map, and therefore would get stuck and no longer be able to fight the navies in the battle. Fix for broken deployment area on port tile near the Dolmens in France. Faction Trait Icons fix – adjust to newer Emperor Edition colour scheme. Increased armour of Foot Companions. Increased melee attack of Thracian Slingers, Bowmen, Skirmishers. 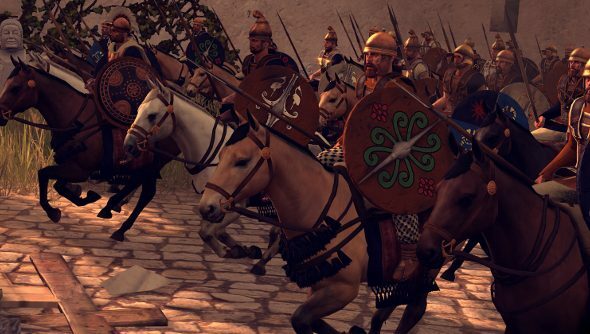 Increased charge bonus of Carthaginian Noble Cavalry. Increased damage of longbows but reduced reload rate. Increased health of First Cohort and Eagle Cohort. Removed square from noble Spearmen and Persian Hoplites. Increased range of Nubian Bowmen to 150. Increased the health, attack and melee defence of Egyptian Cavalry. Increased the health of Thureos Spears by 5. Karian Axemen ranged weapon swapped for the same javelins as used by Thureos Spears. Increased the attack, armour and health of Mercenary Leopard Warriors. Increased the morale and armour of Camel Spearmen. Increased the morale of Camel Archers. Attack and charge bonus increased for Agrianian Axemen. Increased the armour of Thessalian Cavalry. Changed weapon of Hippeus Lancers so they do more damage. Increased the morale and health of Elite Persian Archers. Increased the armour, charge and melee defence of Etruscan Hoplites. Increased the morale of Light Hoplites. Increased the health of Heroes of Sparta. Increased the range of Gallic Hunters. Increased the health of Celtic Skirmishers. Increased the melee attack, charge bonus and melee defence of Celtiberian Cavalry. Cantabrian Cavalry have been given higher damage javelins.. Increased the armour of Veteran Riders. Increased the hit points of Horse Runners. Increased the armour of Bloodsworn. Increased the armour and morale of Spear Wall. Increased the morale and melee defence of Night Hunters. Increased the melee attack and melee defence of Fierce Swords. Increased the range of Dacian Heavy Bowmen. Increased the health and melee attack of Dacian Heavy Skirmishers. Increased the armour of Thracian Peltasts. Increased the morale of Thracian Warriors. Increased the health of Tribal Warriors and reduced speed. Increased the morale and melee defence of Illyrian Cavalry. Increased the morale of Parthian Foot Archers. Swapped the shield type of Scythian Royal Skirmishers and Sarmatian Horsemen to one with more armour. Increased armour and health of Sarmatian Royal Lancers. Reduced the mass of chariots. Increased the mass of elephants. Added hoplite wall to Persian Hoplites. Rapid Advance for Gorgo’s Skirmishers replaced with Rapid Reload. Added Frenzied Charge to Mighty Horse. Added Frenzied Charge to Illyrian Cavalry. Added Hoplite Wall for Noble Spearmen. Added Drago to Saka Noble Armoured Lancers. All camel units have gained the resistant to fatigue attribute. Thureos Hoplites cost decreased to 600. Illyrian Thureos Spears cost increased to 380. Iberian Swordsmen cost increased to 350. Thureos Spears cost increased to 560. Riders of the Hunt cost decreased to 570. (Mercenary) Rhodian Slingers cost decrease to 590. Evocati Cohort cost increased to 890. Triarii cost decreased to 790. Egyptian cavalry increased to 600. Increased the custom/multiplayer battle cap of Mercenary Axe Warriors to 4. Mercenary Thracian Warriors added to custom/multiplayer battle roster for *Macedon and Athens. Mercenary Samnite Warriors added to custom/multiplayer battle roster for Epirus. Mercenary Italian Cavalry added to custom/multiplayer battle roster for Syracuse. Mercenary Cappadocian Cavalry, Mercenary Skirmisher Cavalry and Mercenary *Syrian Archers added to custom/multiplayer roster for Galatia. Mercenary Germanic Scout Riders added to custom/multiplayer battle roster for Nervii. Mercenary Veteran Hoplites added to custom/multiplayer battle roster for the Odrysian Kingdom. Factional mercenaries for Tylis swapped from Dacian to Celtic units. Mercenary Tarantine Cavalry added to custom/multiplayer roster for Ardiaei. Mercenary Persian Cavalry added to custom/multiplayer roster for Pontus. Cappadocian Cavalry added to campaign and battle roster for Pontus. Mercenary Naked Swords added to custom/multiplayer battle roster for Pontus. Mercenary Amazonian Riders added to custom/multiplayer battle roster for *Roxolani and Massagetae. In the Mac Steam version of the game, some changes to the games options during play will not be kept once the game is restarted.